Welcome to FunTime Birdy where we consider play time to be an important time for each parrot, big or small. 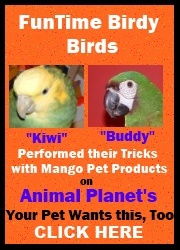 We believe your bird's well being is of the utmost importance. Our Parrot Playgyms, Bird Toys and Parrot Toys are uniquely designed for that important playtime in your feathered friends day. Bird care has evolved over the years to encompass many things. The old days of leaving your bird in bird cages with one toy are gone for good! Birds of today need many types of bird toys such as foraging bird toys, shreddable bird toys, educational and trick training bird toys and don't forget about the all important bird foot toys. Whether your setting up a new bird cage or just redecorating your feathered friends home we have lots of bird perches and bird stands to choose from. Let your bird's feet rest on a soft Booda Comfy bird Perch or your bird can enjoy the wild with a Hardwood bird Perch. 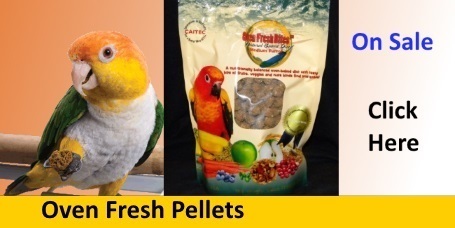 To help with keeping your feathered friends nails trimmed try a Manicure and Pedicure bird perch or your bird can enjoy a bite to eat with a wonderful Tooty Fruity Edible Bird Perch. Give your bird the rays of the sun during the day with Full Spectrum Lighting by Featherbrite and don't forget to get some Parrot DVD's to gain knowledge on parrot behavior and training. Going on a trip, taking your feathered friend for a vet visit or just to a friends house....Crystal Flight Carriers are a must have. I have used these carriers for over 19 years now and we just love them. Finally no bird's home is complete without some Oven Fresh Bites by Caitec to enjoy. All our flock members love them! We even tried them and they taste and smell so good. We love to hear from our customers and their birds so we have dedicated a whole section of our website just for them, complete with pictures and comments. Check out what our customers and their birdies (pictures and all) have to say about us on our Customer Photo Gallery Page. We are always looking to add more fun bird stuff and bird suppliesto our site so check back often. Join our email list for the latest hot products and special sales. Feel free to contact us any time if you have any questions or if you need any help. We love to talk bird (LOL) with our customers. Why Does my Bird Need a Playgym? How Many Bird Toys Should my Bird Have in his Cage?